GUARANTEED TO GET RID OF THE TOUGHEST PET ODORS! 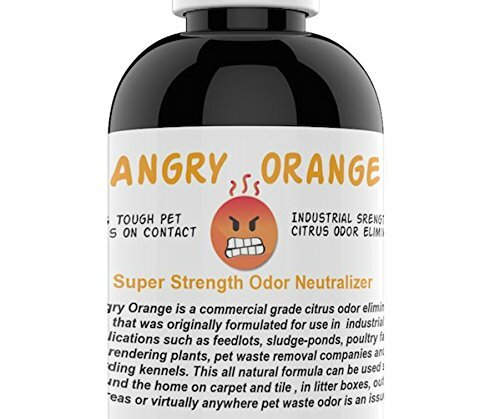 Angry Orange is a commercial grade citrus odor eliminator that was originally formulated for use in industrial applications such as feedlots, sludge-ponds, poultry farms, rendering plants, pet waste removal companies and boarding kennels. IMAGINE WHAT IT CAN DO FOR YOU. SUPER SAFE AND NON TOXIC - Angry Orange is a cold press custom formula derived from the oil found in orange peels.It is biodegradable and non-toxic. Meets FDA-GRAS standards. MAKES (4) 32oz SPRAY BOTTLES (1 GALLON) - A little goes a long way.You'll be paying less than $7.50 per 32oz bottle for a superior product compared to $19.97 for other products that are basically carpet cleaning solution with some fragrance. BETTER PRICE FOR A BETTER PRODUCT. PET ODOR ELIMINATOR PLUS MORE. Not only can it be used in the home on carpet and tile, it can be used at eliminating odors in the yard , around bushes, and anywhere pet waste odor is an issue. Other uses include cat litter boxes , eliminates the ammonia and methane odors associated with these, kennel surfaces , pet waste removal containers an so much more. 100% Percent Money Back Guarantee. Originally developed as an agricultural and industrial product aimed at eliminating livestock and poultry production odors. Angry Orange was used in feedlots , sludge-ponds, poultry farms and rendering plants. It became a huge success and far surpassed estimated effectiveness. It was also discovered as an effective odor control and disinfectant product for the pet industry as well. Used by pet waste removal companies and boarding kennels. The rest is history. If Angry Orange is good enough to control odors in these commercial applications just Imagine what it can do for you. It can be used to remove all types of Pet odor and stains including dog urine , cat urine, litter box odors, as a pet odor yard spray,a pet odor remover from concrete ,removes odor from hard wood floors and carpet.